In this thrilling prequel to Street Fighter Alpha, Ryu returns to pay homage to his deceased mentor, but is tormented by disturbing memories of his master’s killer. In a quest to become a true martial arts master, Ryu sets out to hone his street fighting skills and to deliver himself from the haunting legacy of the Dark Hadou. But the ultimate test of his new power can only be accomplished through one last fateful confrontation with his arch-nemesis, Gouki. The 'Alpha' subtitle is really misleading as this anime bares very little to the game of the same name. This story starts 25 years before Ryu, and concentrates on Goutetsu teaching his two disciples, the brothers Gouken and Gouki. Gouki is frustrated that Master Goutetsu is holding back, and Gouki wants to know how he can use this strange more powerful hadou. As Gouki trains with Gouken he finds himself getting stronger in the battle but often collapses after the fight. Goutetsu knows the reason, he is losing Gouki to the dark hadou. With Goutetsu refusing to teach Gouki, Gouki takes on Goutetsu and kills him, taking his bearded necklace in the process. Gouken is distraught and promises to get his revenge on Gouki and continue his masters training. The rest of the story we know, and the anime picks up Ryu as he is coming back for the anniversary of Master Goukens death. However someone else has also returned, and is ready to take on Master Gouken's diciple. 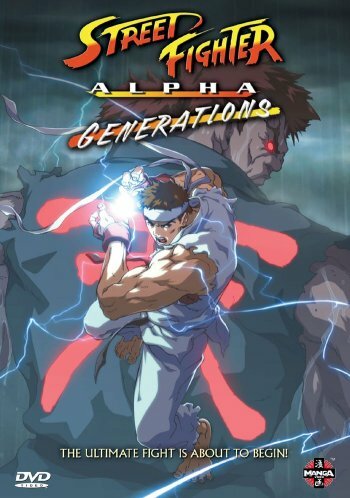 Street Fighter Alpha: Generations DVD Bonus Features include: Behind the Scenes Interview with Cast & Directors, Production Report, Audio options of: English & Japanese Languages; English & Japanese 5.1 Dolby Digital Surround Sound and Motion Menus. The soundtrack was created by legendary musician and record producer, Bill Laswell. At 45 minutes this DVD struggles to be worth anything more than £10. The animation is good, and the art style comes across far more subdued and less your typical anime fare. Ryu and Gouki's signature moves are animated well, but the battles fail to excite in the same way as the previous Street Fighter animes. This is not always a bad thing, however I did feel disappointed that there was no real battle, just lots of little skirmishes. I enjoyed this anime, but the original Street Fighter 2 anime still reigns supreme.